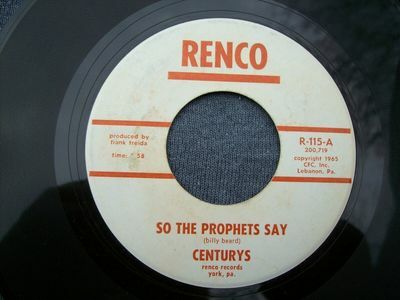 Centurys--So The Prophets Sat / 83--Renco 115. Great 1965 garage two-sider from Lebanon, Pennsylvania. This was their first single. The vinyl is Mint -. The labels have light water stains, as many of the copies did. Obscure '60s garage collectible!